Betfair bonus: Bet £10, Get £30 FREE! Betfair Bonus: £30 Free Bets! Sign up now for your bonus with Betfair, Bet £10 and you will receive £30 in Free Bets! It’s as simple as Tap Tap Boom! 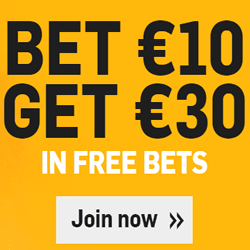 How to get £30 Free Bets from Betfair? Open your new account through this link using promo code ZSK200. Place a Sportsbook bet (min £10) at odds of at least 1.20 (1/5) within 30 days of opening your account. Within 24 hours of your qualifying bet being accepted, you will be offered a free bet up to a maximum of £30. This will be paid as three £10 free bet increments. You’ll be able to see details of your free bet in the ‘My Free Bets’ tab accessed through the header of bookmaker’s website. Your free bet must be used within 30 days and can only be redeemed against one bet on any Sportsbook (Fixed Odds) market at odds of at least 1.20 (1/5). Please, see Full Offer Terms and Conditions on Betfair’s website. This entry was posted in Betting News.